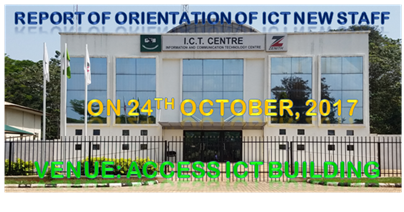 Report on the Orientation for Newly Employed ICT Staff Held on the 24th October, 2017 at ICT Access Bank Building Director’s Opening Remarks: The Director Dr. Olisa Okeke thought it wise to organize an orientation for the newly employed staff in ICT/Innovation Unit. In his welcome address, he said that the objective of the orientation program is to provide a platform for the newly employed staff to get familiar with their work environment. This is to help them to be effective and highly productive as expected. It will also foster their communication with the team heads, members of their team and the entire ICT staff family. Finally, he encouraged all present especially the new staff to work towards achieving sustainable growth through their contributions to ICT and the entire university. They should give their very best in their work output. He also obliged them to see themselves not just as civil servants but professionals working in ICT/Innovation Centre.